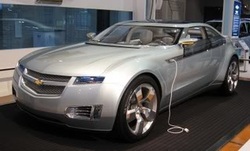 The Chevrolet Volt wish be on trade starting on December 2010. The automobile will be on selling in restricted quantities and in limited markets in the States. This car is considered unique since it's powered by a lithium-ion battery pack and supplemented by a 1.4 liter four cylinder engine. The guys at Chevrolet have been working for this car for several years. The Chevy Vold coul eventually lay the groundwork for future cars by utilizing its Voltec Technology. This development has successfully produced hype all over the place amongst the automotive fans. The Volt shares the same platform foundation its Chevrolet Cruze compact, but these two models are starkly different from each other. The Chevy Volt has a unique body, aerodynamically designed to enhance fuel economy at all times. As designed, the Volt will run on battery only power for the first 40 miles of drive before the supplemental gas engine kicks in. This extended range electric vehicle should be able to travel more than 340 miles on a full tank of gas and much further with additional fill ups. A nightly recharge will replenish the battery allowing the car to operate in electric-only mode once again. So why buy a Volt and not a conventional hybrid vehicle such as the Toyota Prius or Honda Insight? Well, the Chevy Volt will offer far superior fuel economy, consuming less than half of the amount of gasoline the typical hybrid uses. In addition, when operating in electric-only mode, the Volt will emit zero emissions, something no hybrid can claim. What is so special about the Volt? Many things including that it will allow GM to finally say that it has built and sold an electric car. GM did build a modern electric car dubbed the EV1 beginning in the 1990s, but that program was canceled. GM never got beyond the test phase for those vehicles and received criticism for "killing the electric car" with some people suggesting a widespread conspiracy with the oil companies. Conspiracy theory aside, the earlier electric vehicle or EV likely cost too much to produce and that technology wasn't as advanced as what will be found in the Chevy Volt. For one, the lithium-ion battery pack is far superior than the nickel-cadmium pack used in the EV1, offering better range and lighter materials. In addition, the testing GM has been doing with the Volt demonstrates that the car won't wilt under Arizona desert driving conditions or freeze up in a Minnesota winter. The pricetag of $41,000 will certainlly limit the number of people that purchase the Chevy Volt. But, that price tag is cut by $7,500 for individuals who are eligible for federal rebate. In addition to that, California and several other states have $5,000 rebate available. It means that you'll need about $28,500 plus taxes, license, and tags in order to bring a Chevy Volt home. Lastly, for persons who drive Volt 15,000 miles a year, they will be saving approximately 500 gallons anually. If we calculate using gas prices averaging $3 gallon, then you'll be saving about $1,500 per year or $15,000 for ten years with assumption that if gas price goes up you'll be saving more of course.